Choosing the perfect diamond ring often depends on a lot of factors. You have to choose the stone, the cut, the setting, and the band. You can go with a solitaire or a cluster. There are a seemingly endless combinations – and boy, what a dilemma to have! When narrowing down your options, don’t forget about the lively radiant shape cut diamond – it might be exactly the kind of brilliance you need. 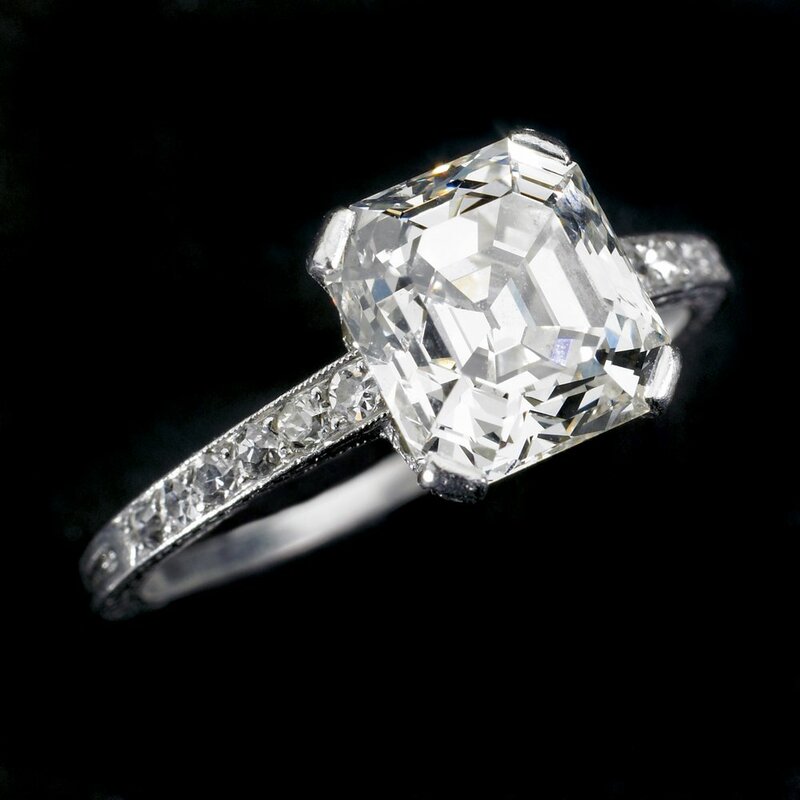 A radiant-cut diamond has a square or rectangular shape with slightly cropped corners. This gives you the chance to enjoy an asscher or emerald shape, but with even more dazzle! Radiant cut diamonds also provide you with the fire of a round diamond. Fire refers to light refraction that gives off a rainbow-like colour. The greater the fire, the more the ring will shine, so you want a diamond that is cut in such a way that it will reflect light as much as possible. With the radiant shape cut, your diamond will have 70 facets – 25 on top, 8 on the girdle and 37 on the bottom – which makes it play with the light beautifully. Besides for that extra sparkle you love, the high facet number of a radiant shape cut will also help disguise any minor flaws. The radiant’s shape and truncated corners also make it much stronger and “wearable” cut. Without sharp or large edges, it won’t get caught on clothing or objects and is less prone to suffering damage. When it comes to accessorizing your radiant cut, you want a setting that will be as beautiful as the diamond! A radiant cut diamond looks great when paired with platinum metal and settings. This is because platinum is bright and will create extra brilliance when placed next to the radiant diamond’s luminous powers. Do use a 4-pronged setting, which is great for the radiant cut diamond. It will keep it in place, while making sure it can receive the most light in the room to shine. Don’t use a bezel setting, as this will dull some of the diamond’s brilliance. This is because the setting makes use of a metal case in which the diamond sits and is raised slightly above the diamond. You can also accessorize your radiant cut diamond with a halo setting if you want that extra pop! of brilliance. This border of diamonds can add an extra layer of shine and dimension to your ring, plus it’s the perfect way to make a small diamond look bigger. You can choose this halo to be made of colourful gems that will add personality to your gorgeous ring. To make the most of the radiant cut diamond, you want it to have a precise cut so that it will refract and reflect light beautifully. This also serves to prevent shadows that can show up in a diamond that isn’t properly cut. Since the radiant cut diamond has such a high facet, you want a high clarity, high colour grading and small culet so that any flaws won’t be noticeable. A colour grading of G or higher is essential. This means that the diamond will be near-colourless to completely colourless, which will hide any tinges of colour when light is reflected. 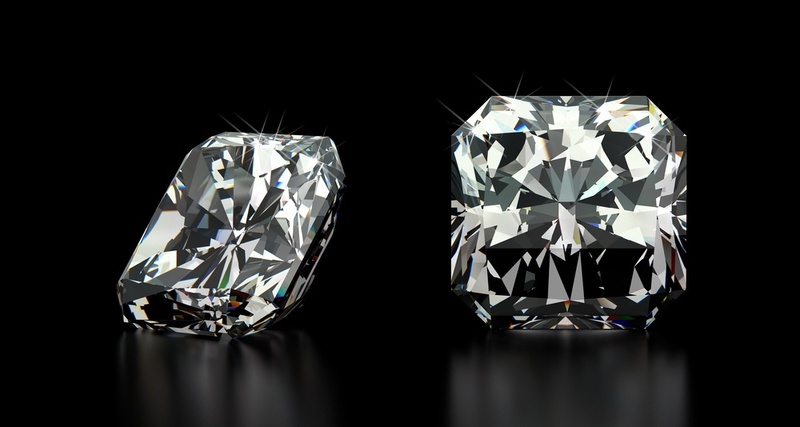 When it comes to clarity, look for a diamond that’s VVS1 or VVS2 on the clarity scale: these mean that there are ‘very very slight’ inclusions or flaws that are not easy to spot when the diamond is magnified. Choose a radiant cut diamond with a very small central culet (the culet is the point at the bottom of the cone-shaped diamond) as well as sides that are parallel and even. This creates proper proportion and is ideal for refracting light because the culet is where the facets meet. In fact, the culet is regarded as an extra facet. A radiant cut diamond is perfectly named because it exudes brilliance and elegance while being modern enough to be accessorized with colourful settings. It’s a wonderful choice for the contemporary bride who enjoys timeless style, either for an engagement or wedding ring!